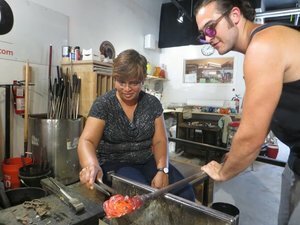 Hot Sand is a public access glassblowing studio located in Asbury Park, NJ where you can blow glass and purchase one of a kind handmade items in our gallery on the Jersey Shore. For over 10 years we have brought the glass art experience to over 20,000 customers through our various Activities we offer. Suntiles and Quickcasts for the youngsters 4+ and under and Glassblowing bubbles, drinking glasses, candy dishes, eggs, and more for the 9+ up! 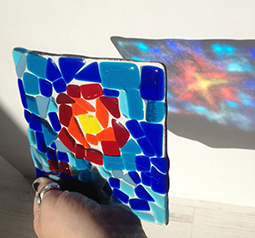 You'll choose to make a one-of-a-kind glass keepsake and learn about the magic of glass! Spend your afternoon with us and go home with a memory you'll never forget. Are you ready to bring your troop, club or class for a totally unique and wholly educational experience they’ll never forget? Over the last 10+ years, we’ve been sharing our joy for Glassblowing with schools and scouts from across the Tri-State area. This is only available on days when we are blowing glass with the public to parties of 10 or more people or projects. Are you thinking you'd like to provide your little loved one with a birthday experience they’re sure to remember forever? Or hosting a team-building workshop, or a Girls Night Out? Not sure where to do that? Hot Sand is the place you're looking for. As we’ve learned, everyone remembers the first time they saw glassblowing! If you're looking to book our entire facility for corporate team building, photo and video shoots, weddings, and evening events, this is it! Your rental begins at 2 hours of private gallery and studio time, 2 glassblowers, and 10 projects with all add-ons. 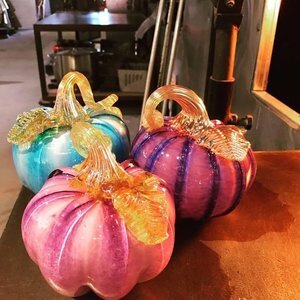 It's all the bells and whistles making your glassblowing experience truly unique. “I truly enjoy Hot Sand, it was the second time we were there and I truly loved the experience. We went for our girlfriend’s birthday. 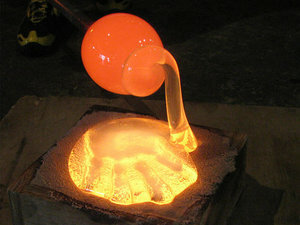 I love glass blowing and the sandboxes to cast your hand or something of importance in for a keepsake memory. The staff is so helpful and knowledgeable. Thank you all for a great day. “Just picked up the items I made last week. I can’t even begin to describe how much I love every single one of them! Not only did I get to assist with blowing my own handmade ornament and pumpkin to have for my baby’s first fall and Christmas, I also had his feet cast in glass. Then, I wanted to try a hand print, but my little guy wouldn’t open his little fists. So, I asked if we could try a fist QuickCast. Can I just tell you? It is the most awesome little fist! I can see his nails and you can even see how he tucks his little thumb inside his fingers. What an amazing way to freeze this little tidbit in time. The staff was amazing. We take our last 2 project sign ups 30 minutes before the end of walk in hours or before if we fill up early. We stop accepting walk-ins when we have people signed up thru our stop time that day. This is typically 1/2 hour before. But on the occasional busy day, we fill up an hour before close. If your glassblowing plans are key on a given day, please arrive early so that we can accommodate you. We are located at the Jersey Shore in historic Asbury Park, NJ.